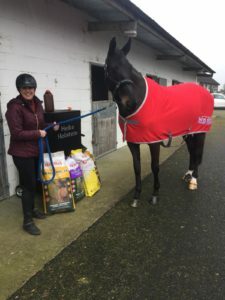 Heike Holstein recorded an impressive result on Sunday at the four-star dressage show in Dortmund, Germany, taking eighth place in the Grand Prix Special with the Irish Sport Horse mare Sambuca with a score of 66.404%. Victory went to Germany’s Isabel Werth with Emilio 107 on a score of 79.128%. On Friday in Dortmund, Heike, who is the reigning Irish national champion, achieved the first of two qualifying scores required for the 2019 FEI European Dressage Championships when scoring 68.217% with her home-bred Irish mare. Meanwhile in Show Jumping, Daniel Bluman and Ladriano Z sealed the deal in Saturday night’s $391,000 Douglas Elliman CSI5* Grand Prix, held at Winter Equestrian Festival in Wellington, Florida. The pair wowed the crowd as they soared over the final jump, stopping the timers at an impressive 37.41 seconds. Co Down’s Dermott Lennon and The Irish Sport Horse MJM Pursuit took victory in Saturday’s John Deere sponsored 1m45 Grand Prix at Vejer De La Frontera in Spain. Lennon was one of 16 riders who progressed to the jump-off where he stormed home clear in an impressive time of 37.37. At Vilamoura in Portugal, Michael Pender and the Irish Sport Horse HHS Matilde finished fourth in the three-star Grand Prix. It has been a great few weeks for Hughes Horse Stud in Vilamoura winning 9 classes in total including 5 ranking classes. On the national eventing circuit, Austin O’Connor had 6 horses competing at Tweseldown, 5 of which finished in the top 10 of their class. Lauren Blades also got her season underway with a 5th place at Oasby Horse Trials in the ON with Rodnikova Dream and 10th in an OI section with Jesmond Justice.